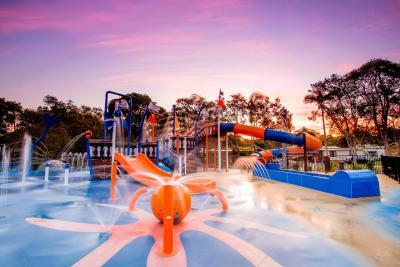 Lock in a great price for Discovery Parks – Byron Bay – rated 8.3 by recent guests! Lovely Campground with great indoor community kitchen amenities!! Mariah who checked us in was ever so patient n always with a smiling face n gave us tips on where to go When there was no signal on our TV, , Daryl came immediately, to see to the problem, n straight away with a smile, upgraded us to a Beautiful Challet . Now this is what I call Excellent Service. Mariah and Daryl are staff who do you proud What a great start to our visit. The cabin was very big, clean and the kitchen was well equipped! The beds were very comfortable! The kids enjoyed the water park and the pool! I liked the updated rooms, expected less so that's nice. Good layout. Good location. Clean. Quite site, rooms way better than online pics which was a nice surprise!! Helpful extras such as kitchen ware etc and a nice outdoor space and set. The cabin is like a tiny house, modern roomy and equip with everything you would need heaps of storage space in the rooms too! Kids loved the jumpy pillow, pool and water play park. The delux cabin was fantastic for our family. A short drive to the heart of Byron Bay. The facilities at the property for kids was excellent..very clean cabins and comfortable beds..
We stayed in a 6 person room and it was massive. It was very comfortable and the bbq on the balcony was great fun. The kids rode their scooters around the park and played in water park most of the time. Great cafe on site as well for my morning coffee and breakfast. 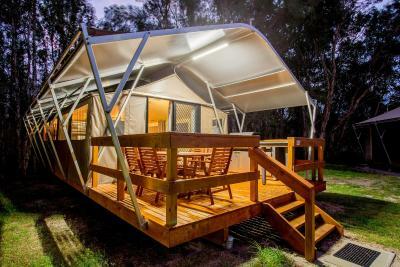 Discovery Parks – Byron Bay This rating is a reflection of how the property compares to the industry standard when it comes to price, facilities and services available. It's based on a self-evaluation by the property. Use this rating to help choose your stay! One of our best sellers in Byron Bay! 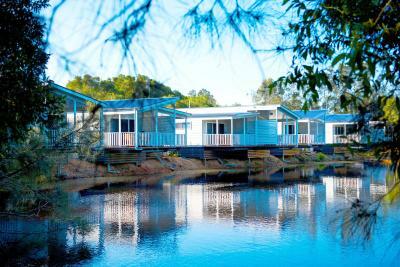 Discovery Parks - Byron Bay offers self-contained cabins, which are spread around its lush grounds by the creek. 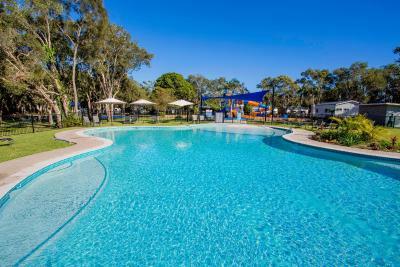 This holiday park includes 2 outdoor swimming pools, a water park with jumping pillow and slides and a full tennis court. 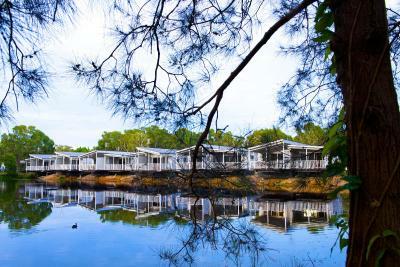 Each cabin comes with private bathrooms, air conditioning, TV, cooking facilities, linen and towels. Guests have access to communal BBQ areas and a camp kitchen. WiFi and free parking are also available. 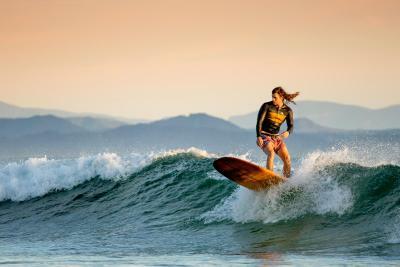 Discovery Parks - Byron Bay is located approximately 1.2 mi from the town center and the beautiful beaches of Byron Bay. 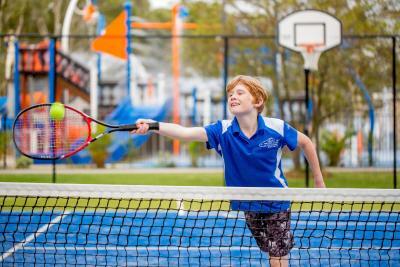 When would you like to stay at Discovery Parks – Byron Bay? This self-contained, 1 bedroom cabin features an private bathroom, TV and a kitchenette with a stove top, microwave and a refrigerator. Linen and towels are provided. This self-contained, 1-bedroom cabin features an private bathroom, TV and a kitchenette with a stove top, microwave and a refrigerator. Linen and towels are included. Please note that there is no capacity for additional guests. This self-contained, 1 bedroom cabin features an private bathroom and a kitchenette with a microwave, refrigerator and stove top. It also includes a TV. Linen and towels are provided. This holiday home has air conditioning, flat-screen TV and microwave. This villa features a balcony, toaster and oven. This studio has a balcony, DVD player and air conditioning. This villa features a balcony, kitchenette and dining area. This tent has a balcony, private entrance and dining area. This studio has air conditioning, kitchenware and flat-screen TV. This bungalow features a microwave. The jewel of the NSW North Coast is Byron Bay - gorgeous beaches, lush green hinterland and an irresistible relaxed pace. 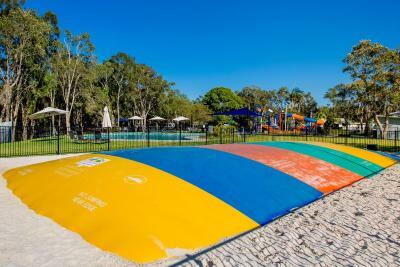 Just two kilometres from the chic town centre is Discovery Parks - Byron Bay. With exceptional holiday park facilities, including the brand new Byron’s Barrel Waterpark, you’ll never want to leave your cabin or caravan. Start with a walk to the Byron Bay lighthouse at Cape Byron, Australia’s easternmost point. Family-friendly Main Beach, Clarke and Wategos Beaches are great for beginner surfers, and Little Wategos – Australia’s easternmost beach - is only accessible on foot. Discover fantastic local produce and handmade goods at Byron Bay’s many markets. 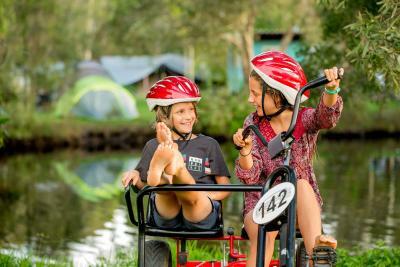 House Rules Discovery Parks – Byron Bay takes special requests – add in the next step! Discovery Parks – Byron Bay accepts these cards and reserves the right to temporarily hold an amount prior to arrival. Please note that there is a 1% charge when you pay with a Visa or Mastercard credit card. Please note that there is a 1% charge when you pay with an American Express or Diners Club credit card. Cabin wasn't very clean, only one face washer for us to use and an old face washer left in bathroom. Comfortable cabins and plenty to keep the kids entertained. Pizza and donut shop was very handy too. A 2k walk to town and beach. Mosquitoes. Reasonably quiet and nice new accommodation. That we had to leave. Everything. In particular the amazing customer service. The room was clean and bright. Was very happy. Also got a free upgrade which was nice. on complete side of deluxe tent windows were erosioned shut. had a fan and aircond, but on the 1st night kids got a cold from fan on and aircond as there bunks were right up near both, but sweated to death if turned off. The MOZZIES OMG you cannot go outside or sit on verander without lapping on the insect repellant (i expect some mossies but. 1000's...hope no one is allergic..) THERE WAS NO WIFI - Only booked and stayed as the website claimed to have wifi abled all over the park/sites, spoke to staff there response was- no you wont get wifi in more than half the park, i said it was a selling point on site (as I had heaps of work to do) they just said oh well, sorry. Tv didnt get most channels and struggled to get a picture. Kids park was a little too old for my 10yr old girls, but yound kids LOVED it! The location was good. park would be great for children up to 8yrs.